Researchers Find Link Between Isolated State Capitals, Corruption : It's All Politics Political scientists have long noted the propensity for self-dealing among politicians in out-of-sight, out-of-mind state capitals like Albany, NY and Springfield, Ill. After comparing federal corruption convictions of state officials and the relative isolation of state capitals, two researchers found a strong correlation. Despite the misspelling and grammar error, the tee-shirt message is clear on a protester at the Illinois capitol on May 16, 2012. 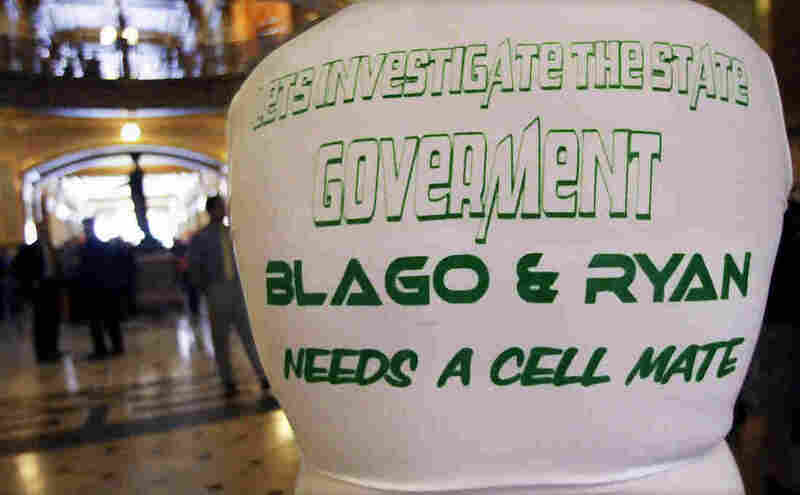 It cites two former governors now in federal prison for corruption. Do state capitals relatively distant from the major population centers have more corruption than those in more densely populated areas? Researchers report that they have found an intriguing correlation between political corruption in state capitals and population density. Political scientists have long noted the propensity for self-dealing among politicians in out-of-sight, out-of-mind state capitals like Albany, NY and Springfield, Ill. But Filipe R. Campante of Harvard University's John F. Kennedy School of Government and Quoc-Anh Doh, of Singapore Management University, decided to see if data supported that view. They compared federal public corruption convictions from 1976 to 2002 with the population surrounding state capitals and found that, indeed, there does appear to be a strong connection. Campante and Doh hypothesized, as political scientists have for some time, that the sparser populations around some state capitals made lawmakers and governors in such places more open to temptation since there are literally fewer people keeping an eye on them. To underscore that point, less densely populated cities tend to have smaller news media outlets that lack the resources to keep their eagle eyes on state policymakers, contributing to the opportunities for corruption. The researchers' examination of the data not only indicated a relationship between the size of the population surrounding a state capital and corruption. It also found that in such states, state policymakers tended to spend less on "public goods" like "education, public welfare and health care" than other states. What's more, voter participation in state elections tended to be lower in states where the capitals were farther from the population centers, the researchers found. While this is all very interesting, it's not clear how to solve the problem. It's not like state capitals are going to be moved to be closer to population centers at this point. And even if that could happen, does anyone really believe that Illinois' corruption problems would be ameliorated if Springfield, the state capital, were moved closer to Chicago with its virtually unrivaled reputation for political chicanery? "From a policy perspective, in particular, one is led to conclude that extra vigilance might be needed, when it comes to polities with isolated capital cities, in order to counteract their tendency towards reduced accountability."